1 John 5:7, the Comma Johanneum, has disappeared from our modern bibles, and probably rightly. It is not found in any Greek manuscript prior to 1500, and it seems to be a marginal comment that found its way into the Latin bible. This text critical evidence tells us that it formed no part of the original Greek text. Theologically it is usually assumed or presumed that any additions or changes to the original Greek text are the work of men, rather than God, and are therefore not legitimately part of the divinely inspired text. So on neither count should it appear in our bibles. Incidentally let us never forget that text critical arguments and theological arguments are not the same thing. However 1 John 5:7 still has its defenders today, and one of them wrote to me recently with an interesting query. Michael Hollner had come across a defence of the authenticity of the passage written by a certain Ben David in 1825. In this appears the claim that Theodore of Mopsuestia referenced 1 John 5:7. Being an honest man, he wanted to know if this was actually true. The pamphlet of 70 pages was entitled Three Letters Addressed to the Editor of The Quarterly Review, in which is Demonstrated the Genuineness of the Three Heavenly Witnesses – I John v. 7, and published in London. “Ben David” was actually a unitarian minister named John Jones. No doubt he felt that the high churchmen of the Quarterly Review might suspect a prank from a unitarian minister. My correspondent’s quotation was itself corrupt and confusing. It is always good policy to go to the original source, and so doing clarified much. A quick look at the Suda online (we do not refer to “Suidas” these days) shows that Ben David made an error; it is not “Theodorus”, i.e. Theodore of Mopsuestia, but Diodorus of Tarsus who is in question here. Diodorus is a shadowy figure to us today, because all of his immense output has perished. Fragments exist, and attempts have been made to collect them, with limited success. But a list of works exists in the Suda, as Ben David rightly says, in section delta 1149. 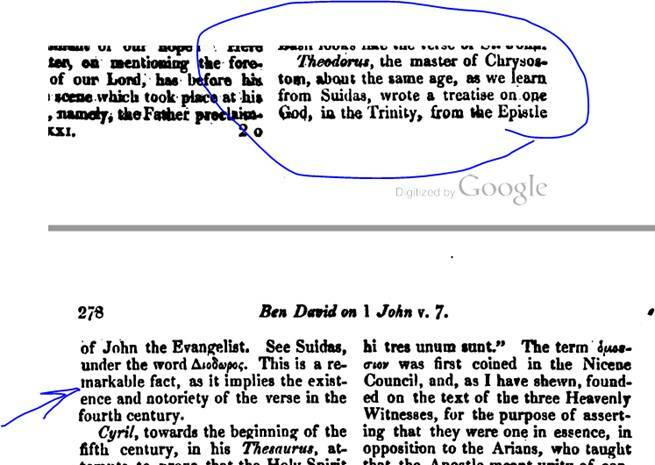 Ben David’s claim, therefore, is that Diodorus of Tarsus wrote a work entitled On the epistle of the evangelist John concerning one God in three, which is listed under that title in the Suda (The subsidiary claim, that this must then refer to 1 John 5:7 is not our concern here). But did he? Διόδωρος, μονάζων, ἐν τοῖς χρόνοις Ἰουλιανοῦ καὶ Οὐάλεντος ἐπισκοπήσας Ταρσῶν τῆς Κιλικίας. οὗτος ἔγραψεν, ὥς φησι Θεόδωρος Ἀναγνώστης ἐν τῇ ἐκκλησιαστικῇ ἱστορίᾳ, διάφορα. εἰσὶ δὲ τάδε: Ἑρμηνεῖαι εἰς τὴν παλαιὰν πᾶσαν: Γένεσιν, Ἔξοδον καὶ ἐφεξῆς: καὶ Εἰς Ψαλμούς: Εἰς τὰς δ# Βασιλείας: Εἰς τὰ ζητούμενα τῶν Παραλειπομένων, Εἰς τὰς Παροιμίας, Τίς διαφορὰ θεωρίας καὶ ἀλληγορίας, Εἰς τὸν Ἐκκλησιαστήν, Εἰς τὸ ᾆσμα τῶν ᾀσμάτων, Εἰς τοὺς προφήτας, Χρονικόν, διορθούμενον τὸ σφάλμα Εὐσεβίου τοῦ Παμφίλου περὶ τῶν χρόνων, Εἰς τὰ δ# Εὐαγγέλια, Εἰς τὰς πράξεις τῶν Ἀποστόλων, Εἰς τὴν ἐπιστολὴν Ἰωάννου τοῦ Εὐαγγελιστοῦ, Περὶ τοῦ, εἷς θεὸς ἐν τριάδι, Κατὰ Μελχισεδεκιτῶν, Κατὰ Ἰουδαίων, Περὶ νεκρῶν ἀναστάσεως, Περὶ ψυχῆς κατὰ διαφόρων περὶ αὐτῆς αἱρέσεων, Πρὸς Γρατιανὸν κεφάλαια, Κατὰ ἀστρονόμων καὶ ἀστρολόγων καὶ εἱμαρμένης, Περὶ σφαίρας καὶ τῶν ζ# ζωνῶν καὶ τῆς ἐναντίας τῶν ἀστέρων πορείας, Περὶ τῆς Ἱππάρχου σφαίρας, Περὶ προνοίας, Κατὰ Πλάτωνος περὶ θεοῦ καὶ θεῶν, Περὶ φύσεως καὶ ὕλης, ἐν ᾧ, τί τὸ δίκαιόν ἐστι, Περὶ θεοῦ καὶ ὕλης Ἑλληνικῆς πεπλασμένης, Ὅτι αἱ ἀόρατοι φύσεις οὐκ ἐκ τῶν στοιχείων, ἀλλ’ ἐκ μηδενὸς μετὰ τῶν στοιχείων ἐδημιουργήθησαν, Πρὸς Εὐφρόνιον φιλόσοφον κατὰ πεῦσιν καὶ ἀπόκρισιν, Κατὰ Ἀριστοτέλους περὶ σώματος οὐρανίου, Πῶς θερμὸς ὁ ἥλιος, Κατὰ τῶν λεγόντων ζῷον τὸν οὐρανόν, Περὶ τοῦ πῶς ἀεὶ μὲν ὁ δημιουργός, οὐκ ἀεὶ δὲ τὰ δημιουργήματα, Πῶς τὸ θέλειν καὶ τὸ μὴ θέλειν ἐπὶ θεοῦ ἀϊδίου ὄντος, Κατὰ Πορφυρίου περὶ ζῴων καὶ θυσιῶν. [sc. At first] a monk, [sc. but later] in the times of Julian and Valens bishop of Tarsus of Cilicia. He wrote a variety of things, as Theodore Lector says in his Ecclesiastical History. They are as follows: Interpretations on the entire Old Testament: Genesis, Exodus, and so forth; and On the Psalms; On the Four Books of the Kingdoms; On Inquiries into the Books of Chronicles, On the Proverbs, What is the Difference between Exposition and Allegory, On Ecclesiastes, On the Song of Songs, On the Prophets, Chronology, straightening out the error of Eusebius [the spiritual son] of Pamphilos about the times, On the Four Gospels, On the Acts of the Apostles, On the Epistle of John the Evangelist, About the One God in Three, Against the Melchisedekites, Against the Jews, About the Resurrection of the Dead, About the Soul against the Various Heresies Concerning It, Chapters to Gratian, Against Astronomers and Astrologers and Fate, About the Sphere and the Seven Zones and of the Contrary Motion of the Stars, About Hipparchus' Sphere, About Providence, Against Plato on God and the Gods, On Nature and Matter, in which is “What is the Just,” Concerning God and the Falsely Imagined Matter of the Greeks, That the Unseen Natures are not from the Elements but Were Made from Nothing along with the Elements, To the Philosopher Euphronius by way of Question and Answer, Against Aristotle concerning Celestial Body, How Hot is the Sun, Against Those Who Say the Heaven is a Living Being, Concerning the Question of How the Creator is Forever but the Created is Not, How is there the Capacity to Will and to be Unwilling in the God who is Eternal, Against Porphyry about Animals and Sacrifices. But as we can instantly see, the Suda online edition introduces a comma, making two works where Ben David reads one. Ben David is not making this up. On the contrary, he is using a contemporary edition. The Latin side of that does the same, as this image sent in by my correspondent makes plain: “In Epistolam Joannis evangelistae, de hoc quod unus est Deus in Trinitate”; but the Greek, note, has punctuation between the two. It’s hard to say what edition Ben David used, of course – this is the Patrologia Graeca, reprinting an earlier edition. The Greek text is punctuated. So the question then becomes… are the manuscripts punctuated? So we see… again it is punctuated. These are two titles, not one. The use of a single point as a divison mark is older than the 10th century, when the Suda was composed. So there is little doubt that the author so punctuated his text. Sadly for my friend, therefore, this particular argument fails. 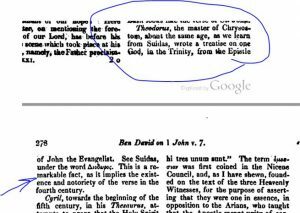 The Suda does NOT say that Diodorus wrote a work on the epistle of John on one God in Trinity. UPDATE: A kind gentleman has sent in the page of Adler’s edition. Our bit is lines 10-11. It would be interesting to know their thinking. But we must never forget that divine inspiration is not identical with “original text”. Thanks for the fine review of the Russian support for the heavenly witnesses, which includes Macarius (1816-1882) and the 1904 Antoniades edition (although some textcrits objected), yet also goes earlier to Mogilas and the 1643 Slavonic BIble, and many others. Essentially, the Orthodox churches accepted the Reformation Bible correction. Note, though, that, earlier Greek writers between the Lateran Council and the Reformation had properly accepted the verse. We have usages from Manuel Calacas and Joseph Bryennius. You are welcome to discuss the details on Facebook on the PureBible forum. This is a common myth. 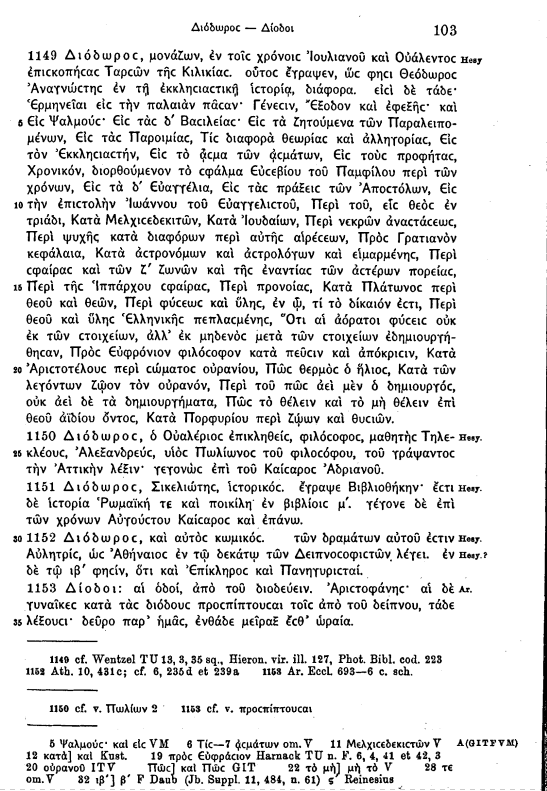 The Disputation of Athanasius against Arius at Nicea is a Greek work that clearly shows such use. And while you might read that it is a 7th century work, the evidence is far stronger for it being 4th century, even very possibly written by Athanasius, as discussed in depth by Charles Forster in the New Plea on p. 51-63. Beyond that, there are many Latin writings that utilize the verse, including the 400 bishops in the 484 Council of Carthage who specifically affirmed the heavenly witnesses text, from John, in their confession of faith contra the Arians under Huneric. Please beware of common myths (often supported by word-parsing) in heavenly witnesses writings. Incidentally, earlier Greek support for the verse comes from Origen, and the Synopsis of Scripture, as well as Cyprian and Tertullian being familiar with Greek and Latin, as well as the incredible evidence from Jerome’s Vulgate Prologue, where Greek manuscripts are referenced. Roger and I also discussed another Jerome related evidence, in Latin. Beyond that there are other allusions and translational-grammatical evidences that support Greek as the original text. Tomorrow, by the grace of the Lord Jesus, I will address the Diodorus question. The scripture cited by Forster in your link, Steven, “Dialogue between an Athanasian and an Arian” provided an interesting quote at the bottom of page 59. Does anybody know where an original language (I guess Greek) text is to be found? All this seems to relate to a debate between Porson and an Archdeacon Travis. Letter 9 of Porson is here. 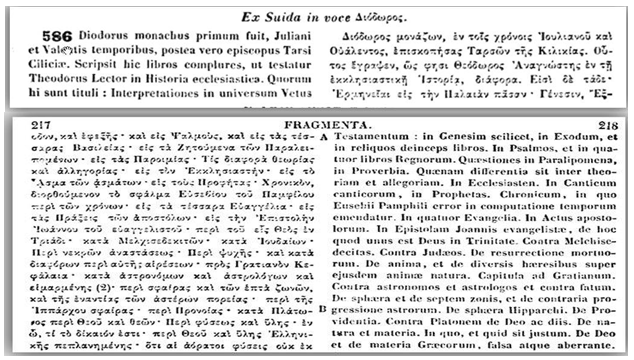 The works in question supposed to be Athanasian are a “Synopsis Scripturae” and a Dialogue against the Arians. These are very vaguely referred to. A Mr Middleton takes up the story here. We appear to be dealing with the works of Athanasius as printed at Paris in 1627 (Opera Athanasii) in two volumes (so this. This, of course, is a pre-critical edition. Vol. 1 I could not find; Vol. 2 is here, with its table of contents here. The Synopsis Sacrae Scripturae is listed, on p.55. The “Synopsis Sacrae Scripturae” is listed in the Clavis Patrum Graecorum as entry 2249 (vol. 3, p.46). The text given is the Patrologia Graeca 28, columns 284-437, reprinted from an edition by Montfaucon. The work is listed as spurious, and derived from Epiphanius, De mensuribus et ponderibus (On weights and measures). Middleton adds (p346) that the “Dialogue between an Athanasian and an Arian” is in this edition, in 5 parts; but that the passage in dispute does not appear in it. Rather it appears in a “Disputation in the Nicene Council against Arius”. In the CPG a “Disputatio contra Arium” is given entry 2250, also spurious; text printed in the PG 28, 440-501. An Armenian version also exists. I would suggest that the first task is to locate whichever passages are involved in the Patrologia Graeca text(s), so that at least we are dealing with something concrete. Googling, I was able to find a 2010 article on the “Disputation contra Arium” (CPG 2250) by Annette von Stockhausen, “Die pseud-athanasianische Disputatio contra Arium. Eine Auseinandersetzung mit »arianischer« Theologie in Dialogform”, in: Stockhausen &c, Von Arius zum Athanasium, Berlin: De Gruyter, 2010, 133-155. It is online here. Also something on the “Synopsis Sacrae Scripturae” (CPG 2249) here. This next should make the Disputatio contra Arium more accessible. Which leads to a pirate url where the text is on p. 21 of 22, you can find it with a search like “Καὶ οἱ τρεῖς τὸ ἕν εἰσιν”. leading to the PDF, where the section is on p. 45, although more chopped up than in pirate land. Spurious is a funny word. With the Disputation all it means is that someone judges that it is not really by Athanasius or directly about Athanasius at the Council of Nicea. It would still be a Greek work referencing the heavenly witnesses, thus immediately refuting the idea that we do not have Greek witnesses and the verse was not used contra the Arians. You can easily see a strong non-spurious edition by reading Charles Forster on the Disputation. Perhaps some of the Athansius scholars will share their thoughts, and I am making some contact attempts. For the Synopsis of Scripture, the full Greek text should be in here (the Michael Marlowe section was simply an extract). And I have a special page, without the Greek section in yet. Off on the train to NYC, so I will leave that here, perhaps someone can extract and work with the Greek. Tomorrow, hope to get back to Diodorus! One only has to READ the Greek text to see that the: “Disputatio contra Arium” is anachronistic in the extreme. One only has to be familiar with and read a little history to know that the debate about the deity of the Holy Spirit was not discussed at Nicea (circa. 325 A.D.). Jerome himself and others (Basil, Epiphanius etc) testify to this. Basil also went as far as to say they “forgot” about the question about the Holy Spirit at Nicea in another letter. Others could be quoted, but it is evident by these comments alone, that the proposition that Athanasius actually engaged in any discussion or debate with Arius, about the Holy Spirit, at the council Nicea is patently anachronistic and false. Later yes! But then, definitely not. Thus, if you read it, the CONTENT of the: “Disputatio contra Arium,” you will quickly comprehend that it BETRAYS ITSELF by blatant this fundamental chronological blunder (i.e. anachronism). That is WHY it is quickly dismissed as a pseudo work (which is something that Steven Avery hard time swallowing). It simply run’s counter to the clear testimony and reading of history. The reality is, the doctrine of the Holy Spirit’s deity arose as a consequence of the council of Nicea’s binitarian (2 into/as 1) declaration of the Father’s  and Son’s  “consubstantiality” which lead to the subsequent 56 years of doctrinal wrangling (“development”). No manuscript of the Psuedo: “Disputatio contra Arium” exist’s prior to the 10th century. 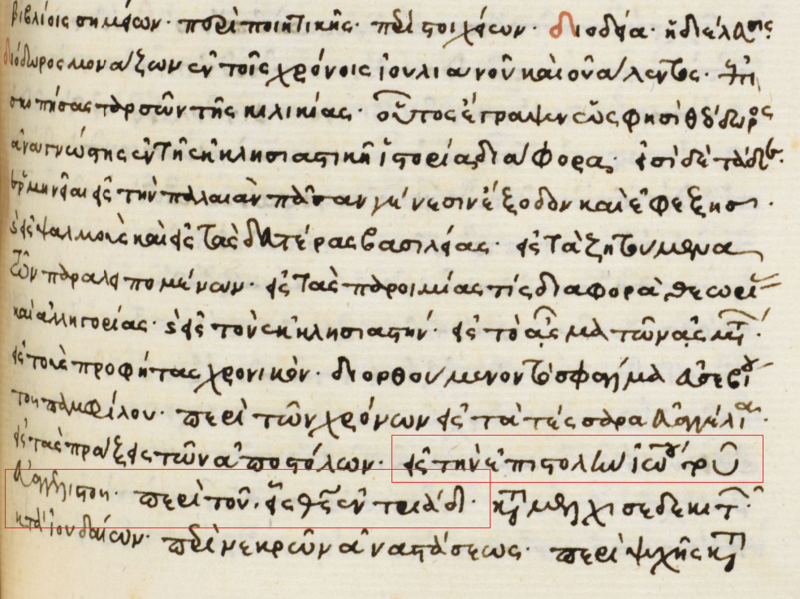 You can read an example of the Greek text (in a very very messy hand) yourself from the link below. Thank you for you well researched article on Didodorus. @matt13weedhacker. Thank you so much for this comment, which I regret was caught by the spam filter (with others). The anachronism on the Holy Spirit seems to have appeared very early – Gelasius of Cyzicus in the 5th century already supposes the same. I ought to look into the “Disputatio contra Arium”, and I appreciate your well-reasoned comment. Hi Rodger. Your comment: “The anachronism on the Holy Spirit seems to have appeared very early – Gelasius of Cyzicus in the 5th century already supposes the same.” Can I please ask for some more information on this please? I have no details. Gelasius of Cyzicus wrote a history of the council of Nicaea; but it is said to be fictional, not least because of the introduction of material about the holy spirit which only appears in later controversy. I’ve never researched that. Sorry! Look in Quasten’s Patrology III and see if it has more!